Some uneven paths, wooden bridges can be slippy after rain. A few stiles, stone steps, and crossing Bacup Road. There is one bench to sit on on the high level path towards the end of the Clough. Ideal picnic spot. Good sturdy waterproof footwear, a walking stick would be handy. Binoculars for bird spotting. If you are catching the bus to the Clough catch the 465 Rawtenstall bus from Todmorden bus station. Ask for Gorpley Clough or the first Clough Foot stop on Bacup Road, opposite a terrace of white painted cottages. Alight from the bus and walk back down the road for 100m to the Gorpley Clough car park. Follow the track and go over a railway footbridge. Keeping to the left head up the road, then go straight on to Stones Road ( the entrance to Dobroyd Castle is on the right). At the bend of the road, go through a stone gap in the wall, next to a yellow topped post. Head right up the steps to another yellow topped post. Watty Farm is in front of you. Go through the metal gate, over a small stream and carry on the path through the woods, then over a wooden stile, in front of you is Bacup Road. Cross the road carefully, turn right up the road until you get to a small car park on your left, which is the entrance to Gorpley Clough and Woods. There are two ways of entering the Clough, but go through the gate on your left (rather than over the stile on your right) and follow the narrow path and wooden bridges along the river up the side of the Clough. You pass several attractive waterfalls. Follow the stone steps upwards at the end of the Clough where there is an Information board on the variety of birds to be seen. At the top of the Clough , with Gorpley Reservoir on your left, turn right, passing a green gate, to a wooden stile to the right. Follow the high level gravel path until you reach reach a bench , here you can rest and enjoy the wonderful views. This path becomes a rough track which you descend back to the car park. Here you can end the walk and catch the bus . On leaving the car park turn left for 100m along the road until you are opposite a terrace of white painted cottages. Cross the road carefully to the bus stop. 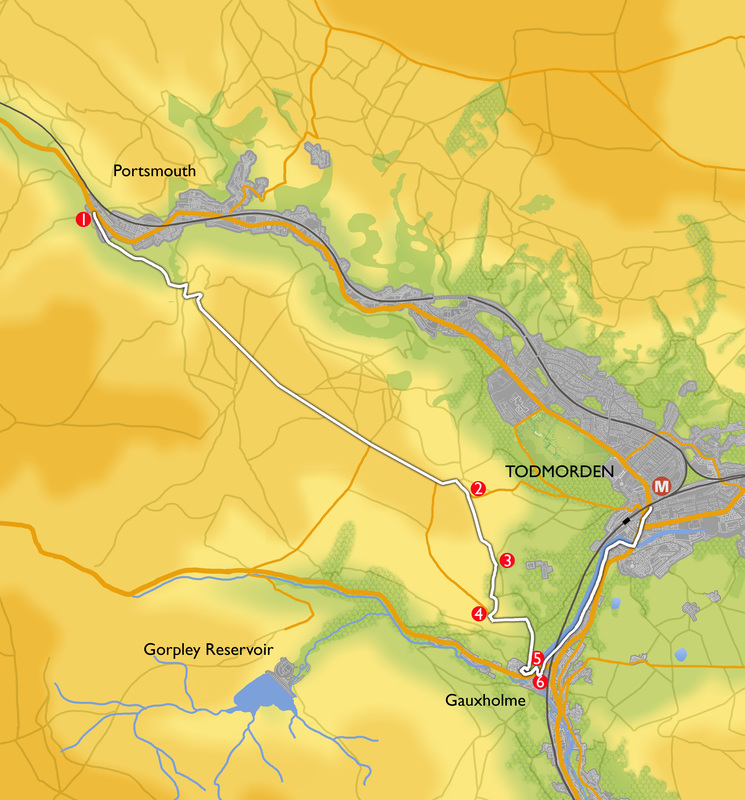 Or retrace your steps by reversing the route back to Todmorden. Turn right at the car park, go down the road 80m, cross the road carefully and go through a gap in the wall, follow the footpath back through the woods. Cross the stream , go through the gate and head for the large gap in the stone wall straight ahead of you. Turn left ( Todmorden Centenary Way ) to a wide grassed path ,and continue uphill between the rocks and hillock until you reach the metal gate and wooden stile at the top of the field. Turn right on the lane then go between 2 black and white posts on the path between the stone walls. Follow the path downhill and a path until you reach the road. Turn left and continue down a road until you see a sign “No through road”. Go down this road , over the railway footbridge and down the track until you reach Rochdale Road. Turn left ( Morrisons is on the right) and walk back to Todmorden Town Centre. 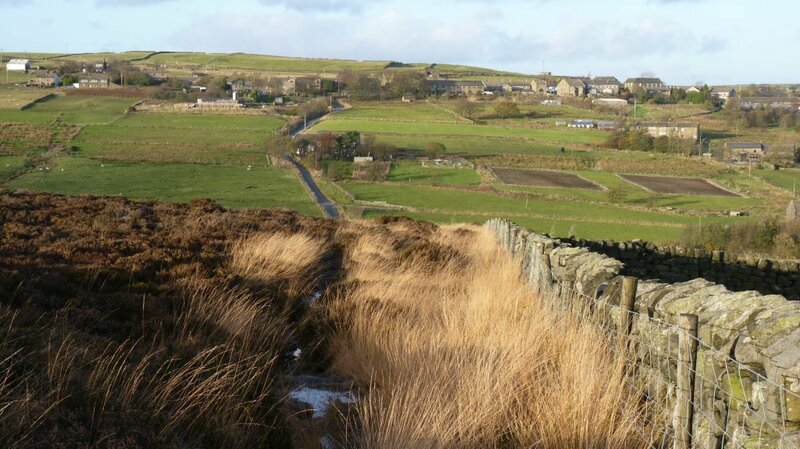 A challenging walk that criss-crosses the narrow reaches of the Upper Calder Valley, with steep ascents and descents on both sides of the valley. There are packhorse trails, high open moorland, deep valleys, wind turbines, a reservoir perimeter and a coniferous plantations. This walk could be split into 3 sections. Several climbs and descents, some steep. Sturdy footwear and warm clothing for the tops. Take the 589 or 592 Burnley bus. Alight in Cornholme village at the Glen View stop, just after St Michael’s Church on the left. Walk back towards the church and turn into the alley on the right, with the church tower of St Michael’s on your left and the back of Roseberry Street on your right. At the end of the street, turn left at the waymark up a footpath heading for the hillside. Bear right up wooden steps and cross a stile onto a grassy path ascending the hillside to the left. Pass a waymark post, then the foundations of an old farm on your right. Carry on up the hillside passing another waymark post and crossing a stream and a broken stone wall on the way up. Near the brow of the hill after crossing a larger stream, follow the wide and well trodden path (an old pack horse route) down to the left. Continue, ignoring a footpath on your left by a waymark post, crossing more streams and heading for the River Calder in the bottom of the valley. There are good views of Cornholme and of Knotts Naze and the railway opposite, as well as down the valley towards Todmorden, and Stoodley Pike in the distance. 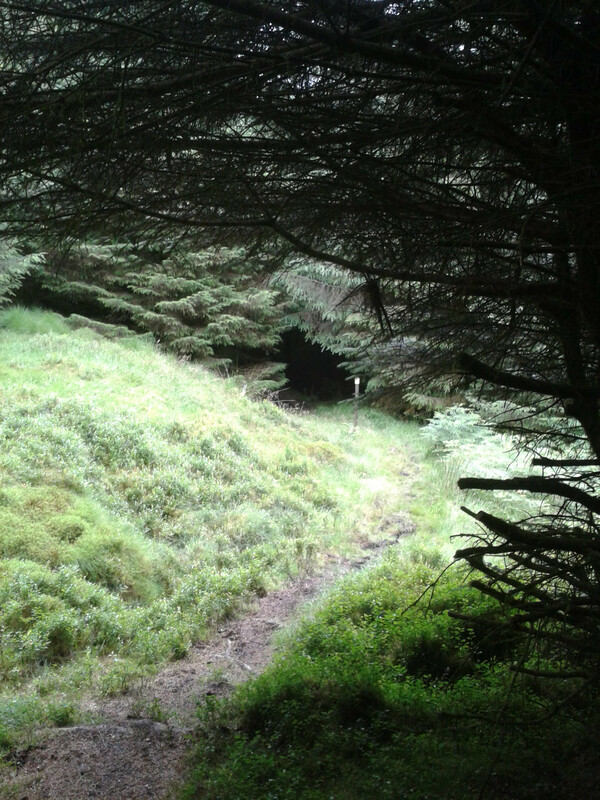 The track narrows and becomes rocky and passes through some trees. Go through a small wooden gate and join a broad track, turning left to reach Burnley Road, and crossing the River Calder over a stone bridge. Turn left, and cross Burnley Road with care then walk back uphill to take the first right turn into Knotts Road. (The car park for the Staff of Life public house is on the left, and you could go through it to make a detour to the characterful pub with its historic stone interior). Follow the road across the railway bridge and continue past a number of old cottages. When the metalled road runs out follow the track to reach an old car port ahead . Follow Bluebell Lane passing conifer woodland on your left, then Coppy Stone Barn, Ridge Gate Farm and Bluebell Farm. The concrete track bears right passing Bluebell Cottages on your left and continues, becoming a tarmac road (Pudding Lane). Head downhill along the road to the edge of the settlement of Shore and as the road bears left, turn right on the track signed Public Bridleway. Follow the track past a house with an arched window in the gable end on your left and continue for 500m until you reach a wooden stile on the left just before a gateway across the track . Cross the stile into boggy terrain, turn sharp left back along the fenceline for 35m then turn right down a wide grassy track to Rough Hey Farm. Follow the footpath, veering to the right over a boggy patch of ground then round the back of the farmhouse between the buildings. Go through two gates, then zig zag downhill past a bench in a lovely spot for a picnic, on the grassy path to Back Rough Farm. Cross a stile just before the farmhouse then exit onto a track. Here you have the option to turn left and follow Pudsey Road which leads back to Cornholme and buses to Todmorden. To continue with the circular walk, turn right onto the track then take the left fork onto a track which bears left. Cross a bridge over Pudsey Clough and ascend the hillside through the trees. As the track reaches open ground, bear right and carry on along the track uphill to pass between two homesteads, and bear right behind the one on your right. Continue on the path heading upwards onto the moors. Follow the track until you reach a gate where another track bears left through a gap in the hillside on your left. Turn left here and follow the path bearing right with ruined buildings down to your left. The path leads round the hillside passing a small pond, then downhill bearing right on grassy tracks to a wider track which comes in from your right. Turn left, and follow the track down to Dean Farm, passing through a wooden gate onto a farm track. Turn right down the track, away from the farm buildings towards the reservoir. Keeping the reservoir on your left, follow the track past the railway bridge on your right to a large metal gate just beyond the reservoir. Go through the gate and bear left to pick up a path across fields heading to the left of a small group of industrial buildings on the edge of Portsmouth. Cross the stile and pass through the industrial site. Turn right by the allotments, along the road to a level crossing and cross the railway with care. Walk down Station Parade with a terrace of houses on your left, to Burnley Road, Portsmouth. Here you can either get a bus back to Todmorden by turning left or continue the walk. To continue the walk, turn right to the Roebuck Inn then cross the Burnley Road to pick up the path opposite the pub signposted ‘Bacup Road 2 miles’. Pass through a large wooden gate and walk uphill into the woods. Follow the track, turning sharp right, continuing steeply uphill out of the woods. Follow the bank of the deep clough on your right (there are waterfalls way below you) onto the open hillside, until you reach a substantial disused quarry on the left with an electricity pylon above. Turn left into the quarry and follow the path round to the left up a short but steep grassy bank. At the top of the quarry head for the stile on the edge of a conifer wood. Cross the stile and follow the way-marked path, with the stone wall on your right. This leads you round the edge of, then into, the woods. The path then enters an open ride in the forest and after a while becomes a rough track. Watch out for mountain bikers where marked bike trails cross the main track. Pass mountain biking shelters on your left and right as the track runs steeply downhill via several left hand bends. Cross a stile beside a locked wooden gate and continue on the track, now in more open country. At a signpost follow the yellow way-marked grassy path to the right, climbing over a stile and joining a tarmac road. Turn right along a short stretch of road and head for a derelict barn. Turn left at the barn and follow the footpath through a small wooden gate with Bearnshaw Tower Farm on your left. Follow this path downhill across open fields till you reach another stile. Cross and follow the rough track downhill past a corrugated iron fence on your left to Frost Holme Terrace on your right. Bear left here to join Burnley Road in Cornholme. Cross the main road with care and turn left for a bus stop with a shelter. A meandering walk from the mining hillside of Todmorden Moor through small hamlets to standing stones, past a once “stately home” dropping down to Centre Vale Park and the town centre. No strenuous uphill sections. Steeper parts are downhills, such as after Stones, and through the beech wood towards the end. Relatively easy. Possible sections of mud particularly after prolonged rain. Gates, stiles, steps. Grazing cattle on public access areas and footpaths should not normally be a problem. Waterproof walking boots. Appropriate seasonal clothing for wind on the moorland section; possibly a walking stick for downhill sections. Take the 465 Rawtenstall bus from Todmorden Bus Station and ask for the stop on Bacup Road after the Astronomy Centre (Second “Holden Gate” stop). Note: there is no bus service on Sundays. Cross the road and take the track signposted public bridleway and Todmorden Centenary Way, to the right of two white painted cottages. After 380m fork to the right at a yellow topped post marked Todmorden Centenary Way. The path here becomes indistinct, so head very slightly to the right of the nearest wind turbine until a yellow topped post can be seen. Follow the yellow topped marker posts, which become blue topped Centenary Way posts. From this path good views are obtained of the observatories down below on the right. The wind turbines were installed on Todmorden Moor in Spring 2014. The White topped posts are markers for the Todmorden Moor Geological and Heritage Trail. Information boards can be seen. This moorland has a rich history of coal mining, clay extraction and stone quarrying. Fossils and worked flints have also been found here. Continue to follow the blue topped posts around the contours of the moor, crossing a small stream, with views of Cloughfoot hamlet down in the valley, Stoodley Pike on the horizon, and ahead and just to right Sourhall settlement. Birds you are likely to see or hear on the moorland include the skylark with its high ascending flight and cascading song, meadow pipits, and the distinctive piping call and down-curved bill of the curlew. On reaching a track, turn right and ignoring a path on the left continue along the track to reach a tarmac road at the start of the Geological Trail. There is an interpretation board for the Todmorden Moor Geological and Heritage Trail at the junction with the road, and another separate panel about the giant Stone crushing wheel 130m before this on the left. Turn right and continue down the road to the small hamlet of Sourhall. After crossing a cattle grid (or passing through the gate) turn right on to Sour Hall Road. The cottages on your left were built in 1840 as a “picker works” but in 1874 after a smallpox epidemic were bought and converted into an isolation hospital, with local worthies, such as Samuel Fielden contributing to the funding. Contributions also came from Bacup and Hebden Bridge. After 400m at Moor Hey, turn left at the public bridleway signpost. After passing through the yard continue through several fields and gates, keeping the stone wall on your right,until you reach another road (Stones Lane). Turn right. After passing a substantial farm on your left (Stones Grange Farm) the first of the standing stones can be seen ahead towards the end of the field on your right, at a modest 1.5m in height. The second and tallest stone, an impressive 4-5m high can be seen just to the left of the road and the third stone to the left, higher up, amongst some trees at the top of the field just above a stone wall corner. The history and age of these standing stones is speculative. Another stone may have stood near to the first one just after the farmhouse, but it was uprooted and a spring appeared. The third stone, among the trees, may have been erected at the beginning of the nineteenth century. The tallest stone may have been reset in a slightly different place from where it originally stood, but nevertheless is still an excellent specimen. On reaching the little hamlet of Stones continue straight on the road (no through road) passing a substantial stone wall around a house and garden. Pass between two posts on to a walled grassy path marked Todmorden Centenary Way Link Path, with a transmitter mast on your left. As the path bends right, over the left hand wall is Lob Quarry. This quarry provided stone for Dobroyd Castle (which, depending on the season can be glimpsed beyond the quarry), and the railway viaduct in Todmorden town centre. Start to descend and when the wall on left ends take the signposted path on the left down the grassy hillside, with the Rochdale Road valley below on your right. After a short steep descent down some steps you come out onto another road (Stones Road). You are on the Calderdale Way,a way marker symbol is painted on the wall to your left, by a grit box. Go left, uphill, passing the entrances to Lob Quarry and Pex House, with views of Dobroyd Castle to your right. Dobroyd Castle was built by John Fielden, son of “honest” John Fielden between 1866 and 1869. The architect was John Gibson who also designed the Unitarian Church(1869) and Town Hall(1875) in Todmorden, and the grounds were laid out by Edward Kemp. The Castle was a family home to the Fieldens until it was sold to the Home Office in the 1940’s. Since then it has been an Approved school, a privately run residential school, a Buddhist Centre and a Children’s Activity Centre. Continue along the track until the gates to Stones hamlet are on your left. Bear to the right on to a grassy track following the sign for the Calderdale Way. The other side of the third standing stone can now be seen on the left. The substantial buildings on the right were the model farm built to serve Dobroyd Castle. 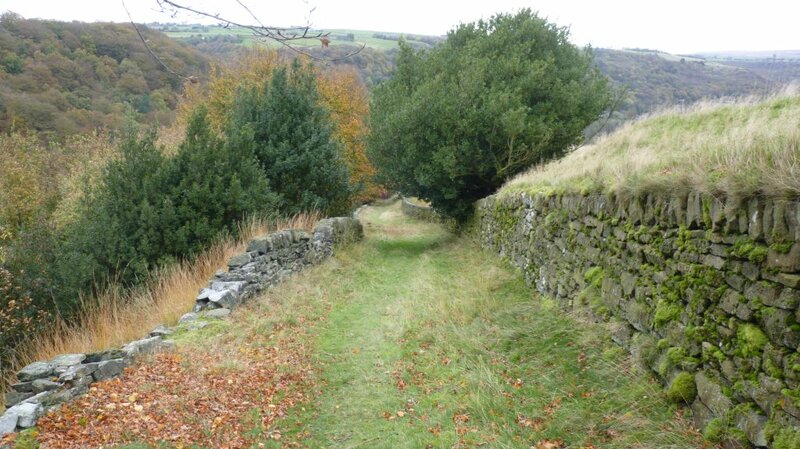 After the next house (Ping Hold) cross the stile and bear left, uphill away from the stone wall on the right, still on the Calderdale Way, with views of Todmorden centre down to the right. The house just below on the right is Edge End, the birthplace of “Honest” John Fielden. Continue through three fields to reach a road. Turn left. After 130m, at the junction turn right and follow the track round to the left passing the sign for Kaley’s Barn. Take a grassy path on the right just before the next house, signposted Calderdale Way running downhill between walls, with views of Stoodley Pike to the right and Whirlaw Hill ahead. Cross a stile, keeping a stone wall on your right. After a kissing gate with Calderdale Way and Todmorden Centenary Way Link Path signs, the path bears to the right and then follows a long fairly steep (slippery when wet) descent through a beech wood. At the road, turn left and after 100m turn sharp right along a wide track signposted Calderdale Way Link path. Continue along this track which becomes tarmacked (Lovers’ Lane), above Todmorden Centre Vale Park. You pass the ruins of Carr Laithe the original home of Ruth Stansfield who married John Fielden the builder of Dobroyd Castle. (You have the option of taking any path down through the park to reach the Burnley Road where you turn right and continue to the town centre.) Continue on Lovers’ Lane to meet a cobbled pathway running down the hill. Turn left and follow the cobbled path down towards the old Christ Church. At the end of the cobbles take the stone steps down with Christ Church (now a private home) on your left. The building on your right is the old vicarage, scene of the infamous murder of 1868. This was a revenge killing by Miles Weatherill who had been forbidden to see his sweetheart, Sarah Bell, by the Reverend Anthony Plow who employed Sarah as a cook. Weatherill, armed with an axe and pistols attacked and killed Jane Smith, employed as a nurse in the vicarage, and attacked Reverend Plow who died a week later. Weatherill was found guilty and duly hanged, – the last public execution in Manchester. Continue along this track to the Burnley Road; turn right to return to the bus station and town centre. 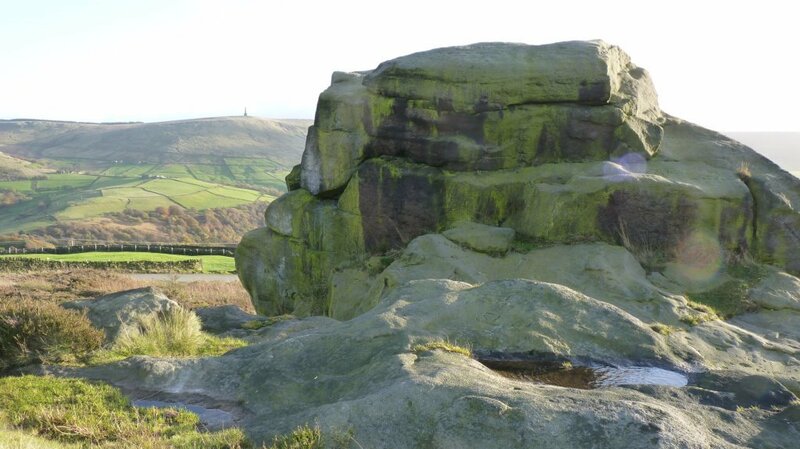 A far-ranging varied walk with open views of moorland, farmland and hamlets, steep wooded valleys. The canal towpath takes you back to Todmorden. Well-signed tracks: sandy, stony and sometimes muddy. Take the T6 or T8 bus from Todmorden Bus Station and ask the driver to drop you off at the Mankinholes YHA Hostel (the stop is officially called ‘Sisley Lane’). Set off along track to the side of the Youth Hostel heading towards Stoodley Pike in the distance. After 400 m, turn right at the cross roads opposite the entrance to Broad Carr Farm. Just before the next house on the right look out for the dragon on the end of their stone barn roof and just after this house over the wall on the right is an unusual outdoor chess board all set out ready to play. At the top of the slope go through the metal gate and turn left on the track which is the Pennine Bridleway. This track is known locally as the London Road and is an ancient packhorse route. 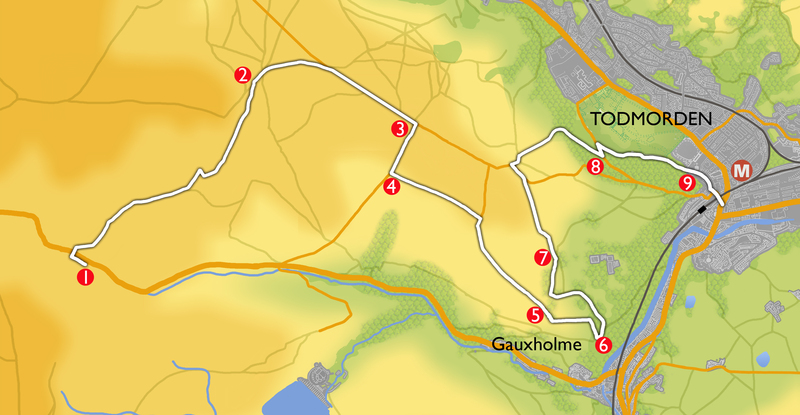 You will continue on this track for about 2.5 km. You have now entered Langfield Common, an extensive area of upland moorland that has been designated a Site of Special Scientific Interest for its flora and fauna. There is a convenient bench here just above the track where you can rest to take in the view. 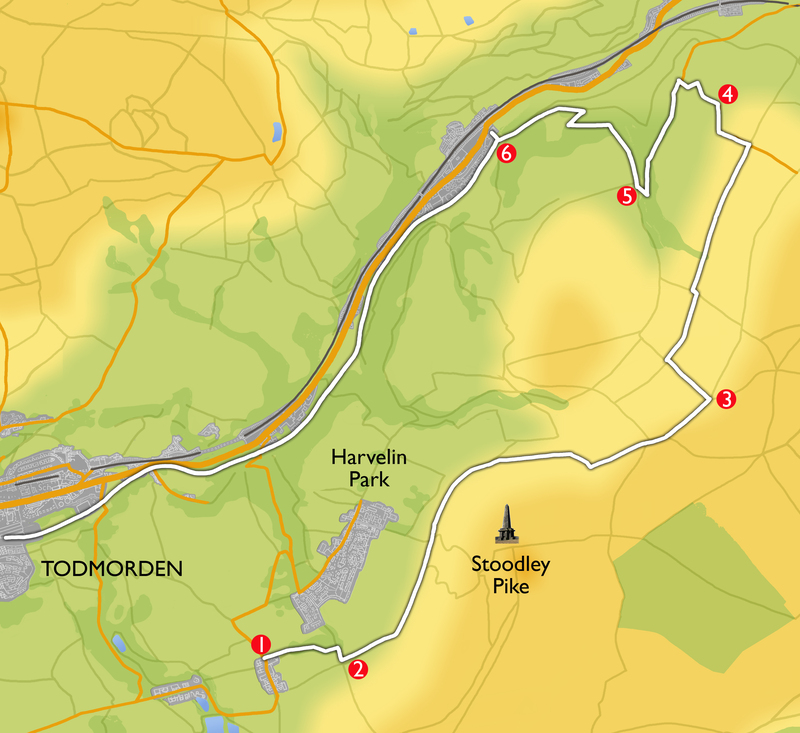 The track skirts below Stoodley Pike and at 1 km there is another bench on your right at the junction with the Todmorden Centenary Way. After another 1.5km go through a gate and continue to where it crosses the Pennine Way by a wooden fingerpost. After 20 m, go through a second gate by a farm building. This is the highest point on the walk with splendid views opening up ahead of Heptonstall with its distinctive church tower on the other side of the Calder Valley. After 400m, turn left on a track waymarked the Pennine Bridleway. After 500m, before reaching the farm at the end, turn right onto the field edge track signposted PBW. You follow this wide path (Pinnacle Lane) for 2km. Continue on through a gate/stile to follow the stone flagged route between stone walls. After 1km, at a farm gate, ignore a left turn signposted PBW and go straight ahead. There is a short stretch of path here which is likely to be very wet with puddles and mud, and you may have to tiptoe over convenient stones before regaining a firmer stone flagged path. You pass a house on your left and come out at T junction with a tarmac road (Broad Lane). Turn left down the hill to Horsehold hamlet. Heptonstall church tower is a focal point in the view ahead the other side of the Calder valley. At the T Junction and Horsehold Farm, turn left through the hamlet and after 50 m, where the road bears right turn sharp left heading through a wooden gate. Follow this splendid path along the top of Horsehold Wood. After 500m you reach a junction with the Pennine Bridleway, take the right fork, cross the bridge over the stream in Beaumont Clough and climb up to a wide track which is both the Pennine Way and the Pennine Bridleway. Turn right down the track, continue downhill through Callis Wood, ignoring lesser paths to the right and left. After 750m you begin a zig zag past Callis Wood Farm (or you can take the short cut, signposted Pennine Way). After 500m you reach the Rochdale Canal at Callis Bridge. 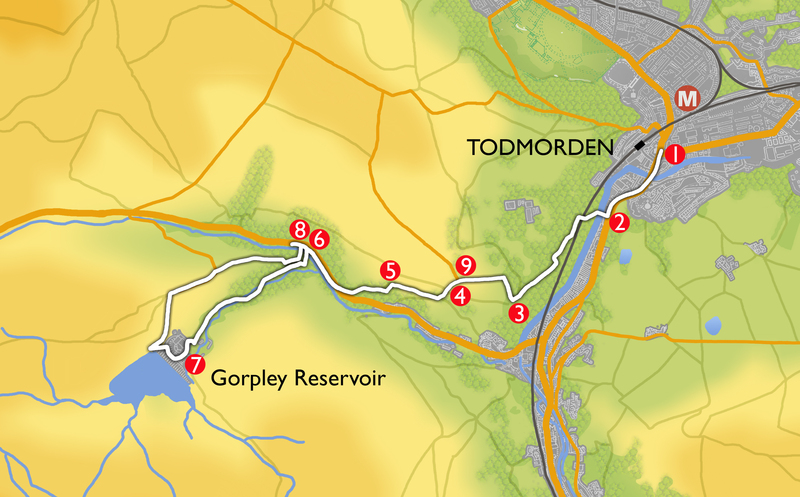 Cross the canal bridge, turn right, and looping back under the bridge take the canal towpath, past the water treatment plant and all the way to Todmorden (4.5 kms). An alternative is to walk on to the main road and to catch any of the Calderdale valley buses back to Todmorden from the bus stop 50m to your left. It is about 11 km (7 miles) and should take up to 4 hours plus. 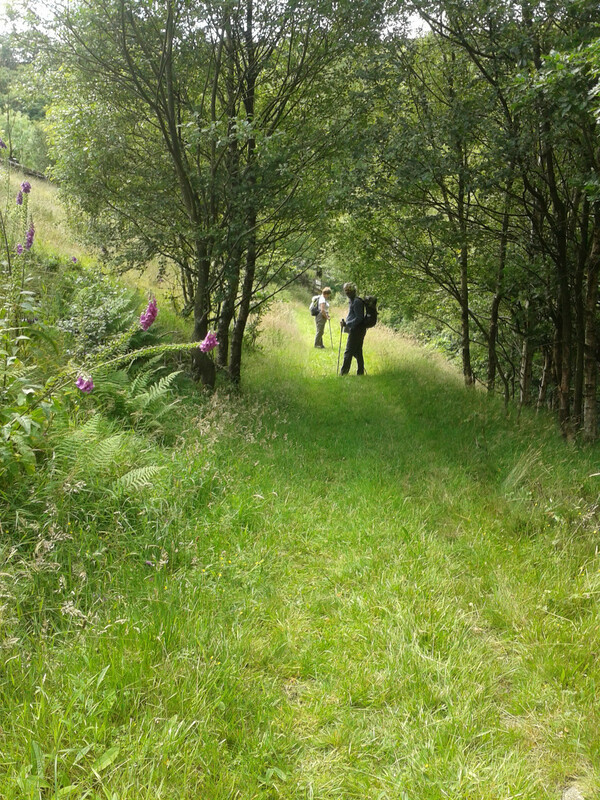 It is a challenging walk, going up then down the steep valley sides twice. 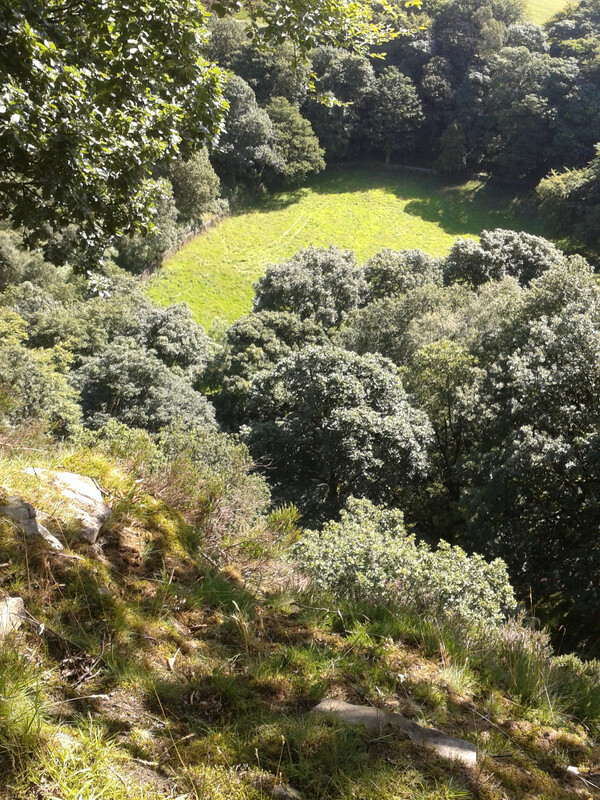 There are some steep valley side paths to negotiate; with some steep drops in place. You will definitely need walking boots and take plenty of food and drink. Take the 590 or 592 Halifax bus from Todmorden Bus Station. Ask for the Horsfall Street stop. Walk along the main road (Halifax Road) in the same direction to arrive at the Lobb Mill Picnic Area and car park. Leave the car park by the waymarked path at the far end, rising steadily across an attractive open heathland area with heather and silver birch trees. Follow the path as it steeply climbs zig-zagging sharp left then at a sharp right hairpin look down on the railway tunnel entrance below. Continue up to quickly gain height. Avoiding any lesser paths stick to the main track, at a waymark take the left path upwards. Turn right along the road for nearly 300m and then turn left between two houses up Butts Road. Climb steeply for 500m passing a small cluster of houses until the road turns sharply left and becomes unsurfaced by a lone house. Here take a short enclosed way right upwards signposted Calderdale Way Link Path for 50m passing though a small gate to reach a crossroad of paths. Turn right to pass through a gap in a tumbled down stone wall in 10m then follow the path reaching a small tree lined stream. There are some tumbling waterfalls upstream when the stream is flowing well. 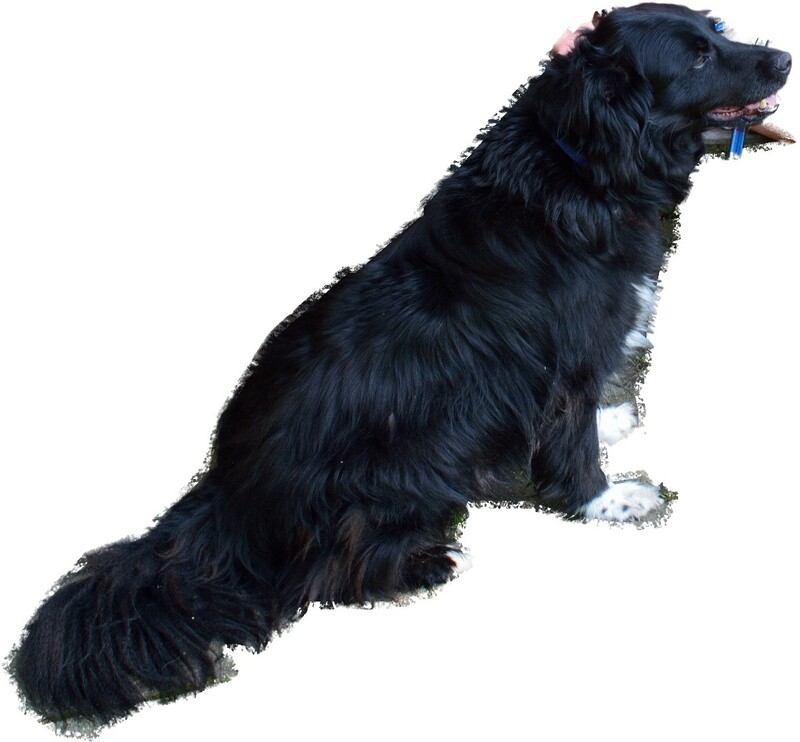 After crossing the stream in 15m do not follow the path ahead, but instead go left briefly uphill then right before resuming a level course ahead passing above the house (Higher Birks) on your right, then proceeding ahead along the bottom of the field . On the far side fork left up an old sunken way which rises gently for 150m between tumbled down old walls, then doubles back left then right before it levels out. At around 320 metres/1050 feet you are almost at the highest point on the walk but you have done the hardest ascent now. Continue along this pleasant greenway at the bottom of the field with a wall on your right passing through what may be a very muddy gate/stile, The path becomes enclosed where it meets a tarmac road. Turn left up to a T-junction, (the highest point of the walk) then right passing a lone house on the left to reach the prominent outlier known as Great Rock. The road loops around it. You can get to the top by scrambling up the far side. There are superb views across upper Calderdale, with the eye inevitably drawn to Stoodley Pike on the other side of the valley. A great place to take a breather after your climb and to savour the fine panorama. Leave Great Rock by the track on the left going up behind the rock (with the road behind you). Keep an eye out for llamas which can sometimes be seen in the fields on the right. This might not be as high as the Andes, but these animals seem to be at home in this exposed spot! Pass though a gate, then cross a stile . You enter the open upland country of heathery Staups Moor where you may see and hear grouse ,skylarks, meadow pipits and curlews. The path descends for 400m with a wall on your right. Cross a track and clamber over the ladder stile, continue to drop down over sedge filled pasture to a waymark post on the brow. Descend steeply down some steps where care is needed to a stile next to the road. Cross over (Hippins) Bridge then turn immediately right on a short access track signposted Calderdale Way to Hippins. Hippins is a Grade II listed Yeomans House with vernacular architecture typical of this area initialled and dated 1650 above the ogee lintel and chamfered surround of a splendid old wooden front door. 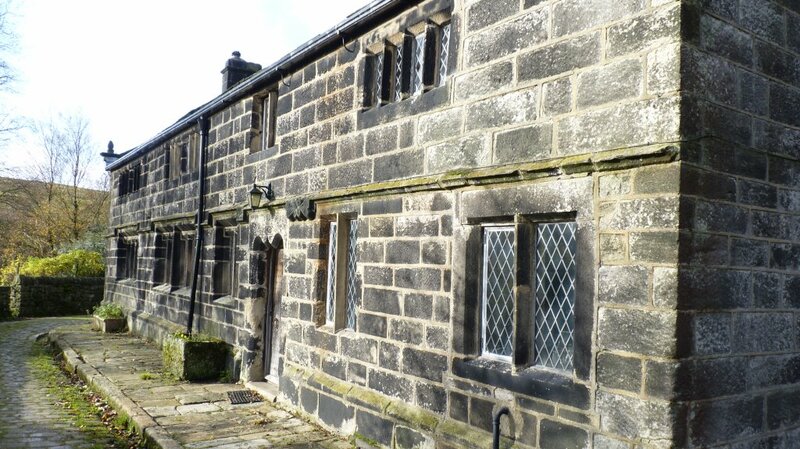 It is constructed of large dressed local stone with a stone slate roof and chamfered mullioned windows. A characterful gem of a 17th century house with an attractive cobbled front access. Just after passing the house go right through a gate and follow the path with a stone wall on your left. By a four way signpost branch off to the right, and descend a path towards Jumble Hole Clough. This brings you to a small metal footbridge which you take over the stream.Turn left and after 110m start the descent of Jumble Hole Clough down some scrambly steps. (Clough is the local name for a steep sided wooded valley which is typically found in this part of the South Pennines). Look out for the waterslide immediately downstream and the line of the water channel constructed to supply Staups Mill which the descending path by the tumbling stream leads you to. 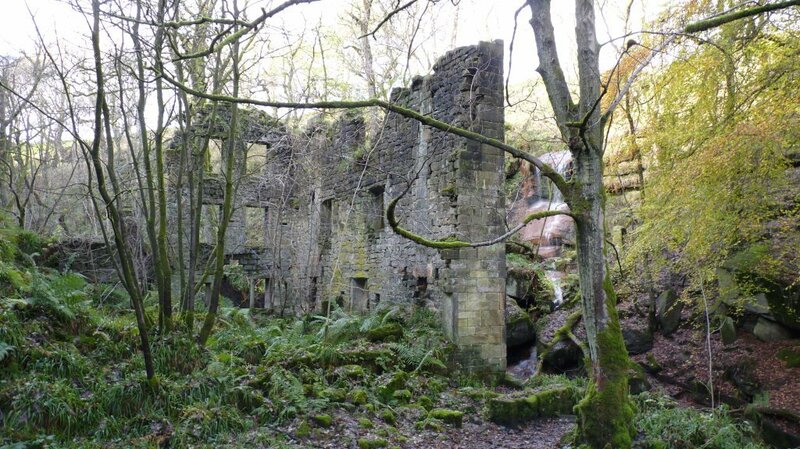 Staups Mill is now a picturesque ruin at the top of Jumble Hole Clough. It is a derelict late 18th century cotton mill hidden deep within the steep confines of the clough that oozes atmosphere, a magical spot, brilliant for a picnic stop or photo opportunity, always a delight to visit. At its height in 1811 it was recorded as having 2 spinning mules with 216 spindles each. On September 24th 1896 7 metres of the retaining wall of the upper dam collapsed and water rushed down Jumble Hole causing great damage but fortunately there were no casualties. Its attractive but remote location with access only on foot or by packhorse led to its ultimate demise as it could not compete economically with larger mills with good transport links. Get your passport ready, as the river here forms the boundary between Todmorden that you have been in, and Hebden Bridge that is on the opposite bank. Leaving the mill the path rises briefly, but look out in 50m for the yellow waymark taking you on a less obvious path off to the left. You proceed parallel to, but high above the beck with occasional glimpses of the fast flowing tumbling stream way down on the left. There are a couple of rocky crags that you need to take care to scramble over. The path descends steadily, to cross angled paths and then briefly levels off as you follow the bottom edge of two fields. Returning to thicker woodland initially you descend on a rugged path before reaching the corner of a concrete farm drive. Continue to descend passing an old mill pond on the left with various old industrial workings in the vicinity ahead. 120m further on follow the sharp hairpin bend left for a further 60m then turn right to cross the bridge over the stream. From the bridge parapet just upstream is an impressive crescent weir 4m in height with a curtain of water falling over the drop. You now follow the concrete track downhill with the stream on your right, and coinciding for a short while with the Pennine Bridleway National Trail. Near the bottom of the woodland just before the first houses turn right to cross a footbridge then take a less used footpath that goes into a field and follows the righthand wall up a small knoll. Here there is a welcome stone seat with a dedication “IN LOVING MEMORY OF KATH”. 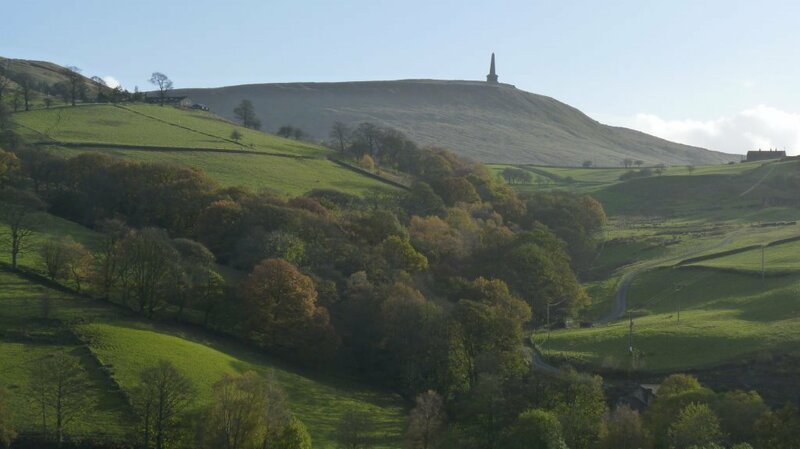 There are lovely views of the steep valley sides and dense woodland that are characteristic of the Calder valley, with Stoodley Pike on the skyline. Continue along the path with the wall on your right passing the back of Mulcture Hall, though a tight stile and the garden to emerge on an access road. Turn left past the side of the house. At the next hairpin bend leave the track and continue straight on along a waymarked grassy footpath that runs between trees and the railway. Turn left to cross a tall metal sided footbridge over the railway line, to drop down to the main road running along the valley floor If you want to finish the walk here then you can walk some 300m along the pavement right to then cross the road to a bus stop. The 590 or 592 bus will take you back to the Todmorden Bus Station. Alternatively if you want an easier walking route back into Todmorden you can cross the main road onto Burnt Acres Lane then go right just before the bridge to join the Rochdale Canal Towpath that offers a level well surfaced path of 3.5 km back to the town centre. To continue the walk carefully cross over the main road onto Burnt Acres Lane. Cross the River Calder and the Rochdale Canal.Continue beyond the canal bridge then start heading left up the tarmac road past a multi- terraced garden that is on your right. Ignore a first path off to the right by a red notice “ Private No Parking” , instead take a 2nd path 100m around the corner on the right which doubles sharply back along the top side of the terraced garden. Go through a small wooden flap gate then gently but steadily climb up a well engineered greenway that goes along the escarpment slope on the top side of Burnt Acres Wood. As the track turns to the left, instead continue straight ahead passing between 2 standing stones, former gateposts, on a waymarked footpath, with a stone wall on your left. Ignore a crossing footpath at 60m proceeding along a terraced footpath that grips the scarp edge and goes though the woodland edge until you cross over a stile at 120m, coming to a more open promontory. 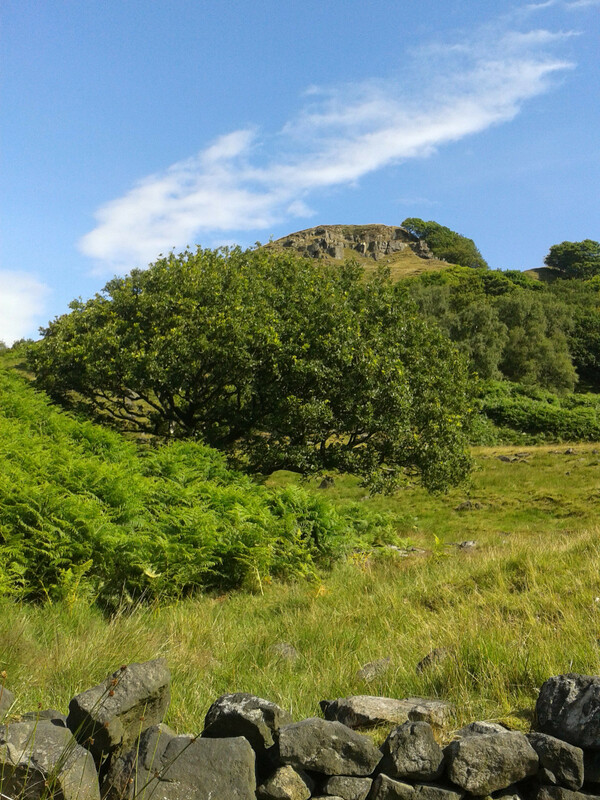 The hillside here can be covered in waist high bracken in the summer and autumn. From here there are views below looking down along the Calder valley, and across the other side you will be able to spot the Great Rock opposite. This splendid viewpoint is appropriately named Height Wood. Continue on the path ahead for 480m with a stonewall on your left. Gradually bear round to the left , to come out onto the corner of a farm access track. Head down the track for 90m, then where the track bends right you depart by taking the footpath left down to a small ford. It is easy to hop across the stream here on a few convenient stones, provided it is not in full spate. Go through the wooden flap stile then ascend steeply passing a house on your left, to reach the brow of the access road. Continue straight on to where the track merges into a tarmac road. You are now on Lee Bottom Road, you pass the gate post entrance to Stoodley Grange on the left which was originally a Victorian Children’s Isolation Hospital converted in 1994 to private dwellings. Walk along Lee Bottom Road for 500m passing Harvelin Park and Manor Close road exits on the left. 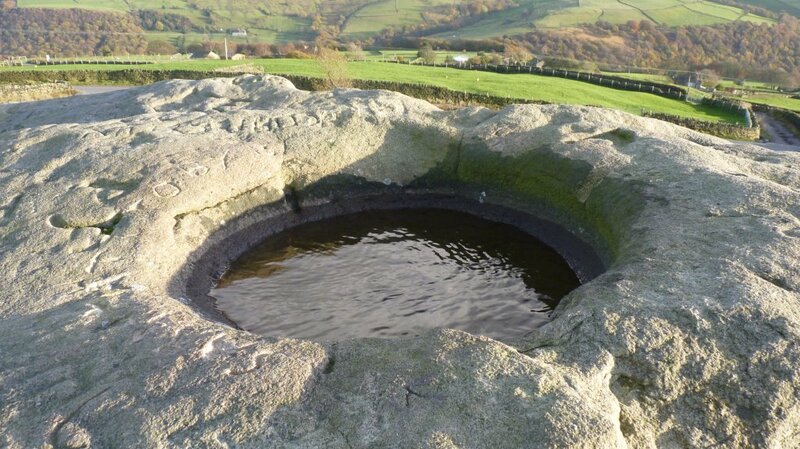 Reach a right hand bend to join Upper Shaw Wood Road (also known as Broad Gate on some maps), look out for spring bubbling into an attractive stone trough. Continue along to reach a junction, turn left into New Road up around the left bend , then look out for entrance driveway to Shaw Farm Livery with metal gates on the right. Just before these gates on the right cross over a stile in the stone wall. Proceed along a footpath skirting the riding centre on your left hand side, initially along a stone flagged path passing a small ornamental pond on your right through a wooden bridleway gate with a notice “ Horses Enter at Own Risk” .With a stone wall on your left and a wooden post and rail fence on your right continue along a stone flagged route, possibly muddy. Pass through a bridleway gate part way along then proceed through another wooden bridleway gate with a metal fieldgate on your right at the end of the field. Continue across the field for 35m to cross the stile ahead through a stone wall. You now traverse left heading down along the edge of Shaw Wood along a steep sloping wooded path through a gap stile in a fence, skirting along the bottom edge of the wood with views across to the right down to the Rochdale Canal and railway viaduct at the bottom of the valley. Carry on along this descending footpath to come out besides 2 isolated houses on the right, then join their access track which merges into the tarmac (Haugh Road) towards the valley bottom . Cross over the Rochdale canal ahead and the river Calder to come out on the main Todmorden to Halifax road (the A646). Proceed right along the footpath, where you will reach a bus stop for the 590 or 592 bus back to Todmorden Bus Station. Alternatively continue for a final 100 metres then carefully cross the road to return to the Picnic Area from which you started. This walk has far-reaching lovely views across open moors from Lancashire to Yorkshire, taking in Pendle Hill, the Calder valleys and Stoodley Pike. 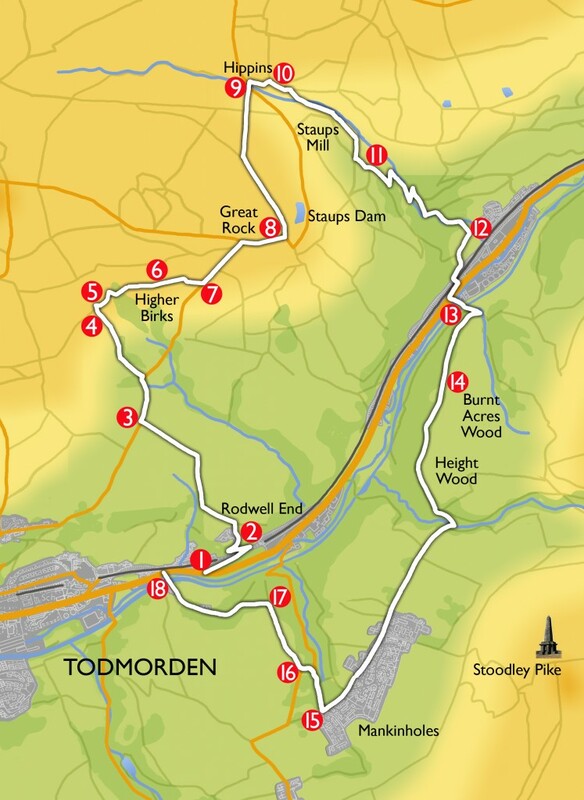 There is a possible detour along the Todmorden Geology Trail. 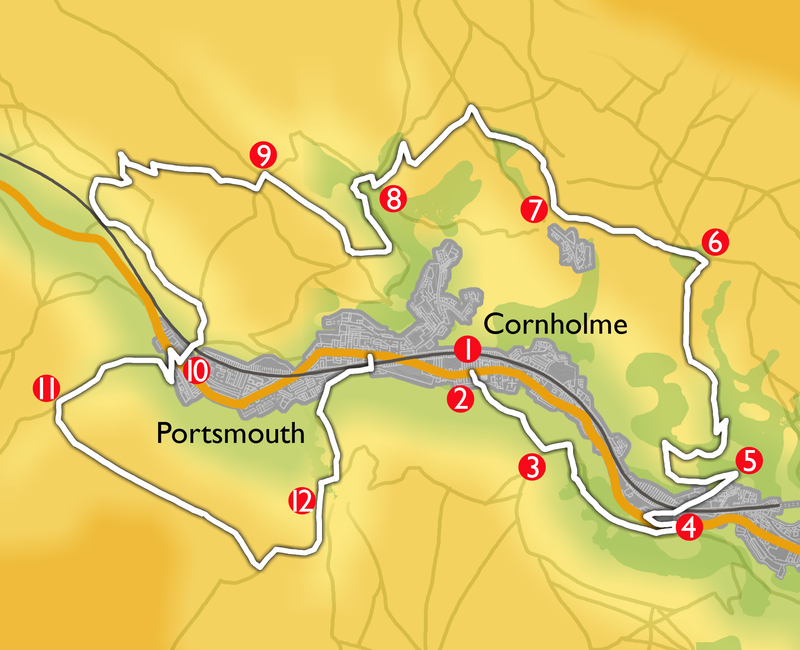 It’s about 7 km (4.5 miles) and should take you about 2.5 hours. Most of this walk is on smooth single track roads , with wide grassy paths and an uneven stone path leading down to the valley. There are a few stiles, gates and steps. Grassy paths can be muddy after rain. You need a good pair of walking shoes. A wind proof top would be handy. Take the 589 or 592 bus to Burnley. Ask for the Burnley Road Portsmouth stop. Walk on in the same direction until you reach Carr Road on your left. Take this road – it is quiet but be alert to traffic. Stay on Carr Road as you climb out of the valley – you will continue along the road for just over 3km (2 miles). Carr Road becomes Tower Causeway as the road begins to level off. Here, there are wonderful views in all directions. As you go downhill you pass on your right the beginning of the Todmorden Geology Trail with its interpretation board. Continue on what is now called Flower Scar Road to reach the small settlement of Sourhall. Go over the cattle grid, and continue ahead up the road with Sourhall Court on your right. The road curves first to the left and then to the right, becoming Parkin Lane. Cross and follow the track. Dobroyd Castle (now an outdoor centre) can be seen on your left and you pass the Model Farm. When you reach a lane, cross it and go through the gate to the left of the house in front of you. There is a Dobroyd Estate notice at the gate which gives you permission to cross the courtyard in front of the house to access a track which leads you to a T junction with a wider lane. Turn left and follow the lane to the point where it bends right and straight ahead there is a path between stone walls (and white and black posts). Take this path, which becomes rougher as it descends down into the valley, emerging onto a road (Pexwood Road). Turn right down Pexwood Road and cross the main road (Bacup Road) to access the canal towpath. With the canal on your left, walk towards Todmorden, under the Gauxholme Bridge and past the Great Wall of Todmorden for 1000m to reach the town centre.